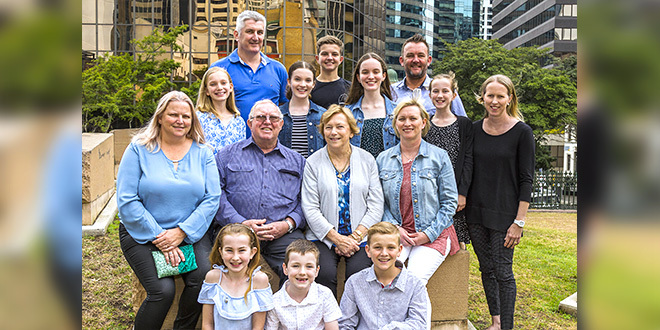 Golden anniversary: Barry and Lorraine Searle with their family after the 2018 Golden Wedding Anniversary Mass at St Stephen’s Cathedral. GREY clouds couldn’t take the sparkle from the eyes of Barry and Lorraine Searle during the 2018 Golden Wedding Anniversary Mass in Brisbane. The Searles stood side-by-side with an assemblage of marriage experts at St Stephen’s Cathedral on October 6, to renew their vows and celebrate 50 years of marriage. “The whole group stood up, we held hands, looked each other in the eyes and renewed our vows,” Mrs Searle said. The annual Mass attracts large numbers, and the Searles took no chances when it came to securing prime real estate. “All the couples were at the front, but apparently some couples keep coming back each year after they’ve had their fiftieth to keep renewing their vows,” she said. The returning veterans included David and Camillus Davall, from The Gap, who celebrated 53 years of marriage and Mary and James Byrne, from Boronia Heights, who recently celebrated the grand achievement of 60 years of marriage. Mrs Byrne said couples that walked together, stayed together. “Anyone who wants to see sixty (years of marriage) needs to keep active,” she said. Brisbane Archbishop Mark Coleridge celebrated the Mass for the couples. “(Archbishop Coleridge) spoke beautifully, saying we were like a heap of precious gold, which is especially precious in today’s world,” Mrs Searle said. Mr and Mrs Searle’s three daughters, two sons-in-law, and eight grandchildren joined them for the Mass.